A rout in financial markets that’s wiped some $2 trillion off the value of global equities over the past week showed signs of easing, with European stocks advancing for the first time in five days and commodities prices stabilizing. The Stoxx Europe 600 Index pulled out of its steepest slide in two months and U.S. equity index futures rose. The currencies of resources-exporting nations recovered some of the last session’s slide as the Bloomberg Commodity Index advanced with crude oil back above $45 a barrel. U.S. Treasuries edged higher along with government bonds across most of Europe after global yields surged to this quarter’s high on Tuesday amid concern global central banks are turning less accommodative. Volatility roared back into financial markets over the past week as the Federal Reserve weighs the case for a U.S. interest-rate increase at a time when the efficacy of stimulus in Europe and Japan is being called into question. A Bank of America Corp. survey showed fund managers have boosted their average cash holdings to levels near to the highest since 2001, with a record proportion of respondents saying stocks and bonds were overvalued. Both the Fed and the Bank of Japan will hold policy reviews next week. Markets are losing confidence in the ability of central banks to boost inflation and there is a limit to how much quantitative easing programs can accomplish, Harvard University Professor of Economics Kenneth Rogoff said Tuesday. The European Central Bank refrained from adding to stimulus last week and the BOJ is conducting a comprehensive review of the costs and benefits of its policies. The Stoxx Europe 600 Index added 0.2 percent as of 8:24 a.m. London time, after sliding 3.4 percent in four days. Industrial output figures for the euro area are due Wednesday and European Commission President Jean-Claude Juncker will deliver a “State of the Union” speech to the European Parliament. Futures on the S&P 500 Index gained 0.1 percent, following a 1.5 percent slump in the underlying gauge. Bayer AG is proposing an increased offer of $56.5 billion as it tries to clinch the acquisition of Monsanto Co. to create the world’s biggest maker of seeds and pesticides, according to people familiar with the matter. Asian shares remained out of favor with the MSCI Asia Pacific Index sliding for a fifth day. The gauge has lost more than 4 percent since reaching a one-year high a week ago. Benchmarks in Shanghai, Indonesia and Taiwan sank to their lowest levels in more than a month. Financial markets in South Korea are closed through the weekend and China’s are trading Wednesday for the last time this week. Banks led losses among Japanese shares after Nikkei newspaper said the BOJ is considering delving deeper into negative interest rates, a controversial policy that squeezes lenders’ earnings. Slightly more than half the economists surveyed by Bloomberg forecast an expansion of monetary stimulus on Sept. 21. “The limits of monetary policy are being discussed, and it’s unclear whether the situation will improve even if the BOJ does add to its easing program,” said Kiyohide Nagata, a senior global strategist at Tokai Tokyo Research Institute Co. The Bloomberg Dollar Spot Index, a gauge of the greenback against 10 peers, was little changed after climbing 0.7 percent on Tuesday. Goldman Sachs Group Inc. is holding fast to a bullish call on the U.S. currency, undeterred by waning expectations for a Fed interest-rate increase this month. The yen fell 0.7 percent. Australia’s dollar and the Mexican peso advanced 0.2 percent as South Africa’s rand gained 0.4 percent. The Aussie sank 1.4 percent on Tuesday, sliding with the currencies of other resource-exporting nations as commodities prices slumped. The yuan strengthened 0.1 percent in Shanghai amid speculation China’s central bank was shoring up the exchange rate before this week’s holidays. HSBC Holdings Plc said a daily fixing for the currency was set stronger than it expected on Wednesday and yuan borrowing costs jumped in Hong Kong, making its costlier to bet on depreciation in the offshore market. The Bloomberg Commodity Index rose 0.3 percent after dropping 1.3 percent on Tuesday. 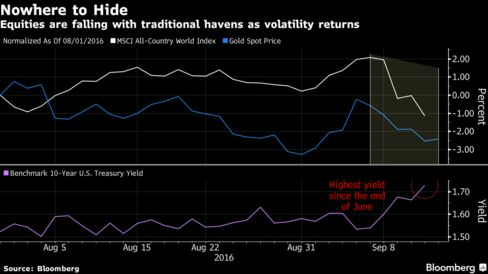 Gold reversed earlier losses to trade 0.2 percent higher, set for its first advance in six days. Crude oil rose 0.7 percent to $45.22 a barrel in New York following a 3 percent tumble in the last session. Official figures due Wednesday are forecast to show U.S. supplies rose by 4 million barrels, exacerbating a glut. 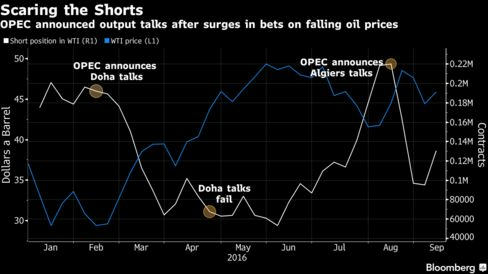 Money managers have been slashing bets on falling oil prices at the fastest pace in five months before major producers meet this month in Algiers to discuss output constraints. Nickel gained 0.7 percent, after slumping almost 5 percent over the last two sessions. Mines in the Philippines, the world’s largest supplier, are being shut amid a nationwide audit of welfare and environmental standards that’s set to end this week. The government said more closures are coming and Goldman Sachs Group Inc. has warned that nickel ore stockpiles could sink to “critically low” levels by March or April 2017. The yield on 10-year U.S. Treasuries fell one basis point to 1.72 percent, following a six basis point gain on Tuesday. The rate on similar-maturity German notes declined 1 1/2 basis points to 0.055 percent as sovereign debt advanced in France, Italy and Spain. The yield on the Bloomberg Global Developed Sovereign Bond Index climbed to this quarter’s high of 0.6 percent in the last session as Mohamed El-Erian, the chief economic adviser at Allianz SE and a Bloomberg View columnist, urged the Fed to get its next interest-rate hike over and done with. The timing would be unlikely to alter a “shallow cycle” of increases, he said. Japan’s yield curve steepened amid speculation the BOJ will concentrate its bond-buying program more heavily on short-term securities. The five-year yield decreased three basis points to minus 0.205 percent, while the 30-year rate jumped as much as 10 basis points to 0.605 percent, the highest since March.